Due, very probably, to some disturbing incident that befell him as a youngster, Professor Marco Prentiss has spent the majority of his life studying pigeons and he has come up with a remarkable theory. The pigeon, or rock dove, is a bird which is familiar to many European towns and cities. They're a favourite with young children who spoil them with breadcrumbs and a scourge to street cleaners who have to excise their daily droppings from the flagstones and monuments of our metropolises. But most of us have hitherto taken them for granted. Professor Prentiss may just change all that. After extensive research he has come to the shocking conclusion that every single pigeon in the world today, and every single pigeon that has ever existed, is in fact the same bird. Not just the same species, or the same family - the same actual animal. "There has only ever been one pigeon throughout the whole of creation," Professor Prentiss explained. "But it has somehow managed to duplicate itself along a temporal axis. 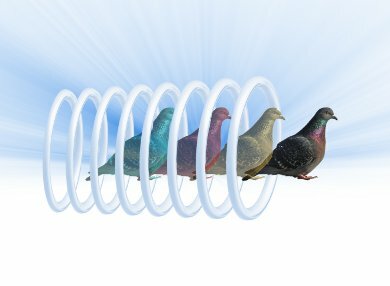 In other words, when we look at a flock of pigeons we are actually seeing just one bird which is co-existing with multiple iterations of itself at the same point in time. Throughout history the pigeon has had billions upon billions of overlapping lifespans, but there has only ever been one of them." To help us understand, Professor Prentiss asks us to imagine that we had a time machine. If he were to get into the machine and emerge five minutes back in the past, to all intents and purposes there would be two of him. "And that's just what the pigeon does," he said. "Except that it doesn't have a time machine. We don't know how it does it really. Probably something to do with its beak." Professor Prentiss explains his theory in greater detail in this month's New Scientist magazine, where he refers to the effect as the animal kingdom's 'copy and paste function'. And since there seems to be little likelihood that such an ability could have evolved naturally, he interprets this as evidence of a divine creator - albeit a very lazy one.